The 612FC Folding Corn Head is one of several new John Deere products for model year 2016. John Deere announced a series of 2016 tractors, harvesting equipment, balers and other product updates on Aug. 25, which include the Multi-Purpose 6E Series Tractors and 459E Round Balers. This comes shortly after the company revealed its new 2016 9RX Series Tractors during a live webcast that aired on Aug. 25. The 9RX Series Tractors feature high horsepower and a four-track design to tackle any terrain. They also have a superior undercarriage with a new positive-drive track system. 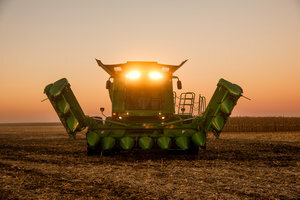 John Deere has made enhancements to its harvesting equipment, including the S-Series Combines, 600C Series Corn Heads and 600F HydraFlex Draper Platforms. A 12-row folding corn head is designed to boost performance and efficiency. The new multipurpose 6E Series Tractors can be purchased with 105, 120 or 135 horsepower and deliver smooth, consistent operation. The 459E Round Balers from John Deere now feature an Edge-to-Edge net wrap option for hay producers. John Deere has expanded its lineup of 8000 Series Self-Propelled Forage Harvesters with additional engine options. John Deere has added to its line of Triple-Mounted Mower-Conditioner machines after seeing initial success with its release in 2012. New updates include wider cutting widths and higher crop cut speeds. The new W155 Self-Propelled Windrower includes faster cutting speeds and a new Final Tier 4 PowerTech engine. John Deere has revealed new precision products, Harvest Mobile and John Deere Field Connect with a Gateway 3G upgrade, for ultimate efficiency out in the field. The 2510H High-Speed Applicator is designed for improved nutrient placement accuracy for more production. For more information on all of the new equipment from John Deere, visit www.Deere.com or speak to your local John Deere dealer.